New buildings for the fairgrounds in Estancia, improved roads and a speedier communications network for first responders might be in the near future for Torrance County if voters approve. Residents and officials from Torrance County met Monday in Mountainair to discuss the five general obligation bonds coming up for voter approval in August. That meeting was one of five being held this week around the county. Torrance County Manager Joy Ansley, County Clerk Linda Jaramillo and attorney Daniel Alsup, legal advisor to the county on the bonds, answered questions about how bonds are generated, where the money would come from, how that bond money would be allocated and who administers the funds. 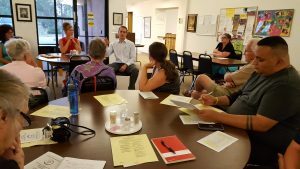 A handful of residents, including a Mountainair town councilor and a candidate for Torrance County Commission, turned out to hear about GO Bonds on the ballot Aug. 16. Photo by Leota Harriman. The meeting opened with Alsup defining the nuts and bolts of what makes a general obligation bond, or GO as it’s called. If all five bonds on the ballot are approved, it would allow the county to take loans of up to $3.8 million, he said. Alsup explained why the county is holding a special election: Bonds issued in 2001 to build the Neil Mertz Judicial Complex in Estancia will be paid off in August this year. By holding the election in August, property tax rates in the county would be held at the same rate if the bonds are approved. If the bonds are rejected by voters, property taxes would go down by $10 for every $30,000 in assessed value. Ansley reviewed the five projects to be put before voters: $1.4 million would be used to improve current communications systems between police, sheriff, fire and other first responders; $700,000 would repair and improve the county fairgrounds in Estancia; $1 million would be spent on roads, and another $150,000 would be used to move the county road department out of the middle of Estancia. Another $550,000 would be spent on repairing and upgrading county buildings, which could include senior centers, the county’s administrative offices and more. Questions from the handful of participants who showed up included whether funds from a bond can be used for a different purpose. Alsup explained that this is not allowed. “What if there’s leftover money? What’s done with that?” asked one person attending. That question seemed to stump both the attorney and government officials momentarily. “While it’s not anticipated that the county will have an overage, if that should happen then the funds would revert to the debt service,” Alsup answered. Asked how the figures had been arrived at, Ansley replied, “The county commission has held a series of meetings this past year to determine the funds necessary to address existing problems. For example, the estimate to fix the fairground buildings in Estancia was based on a similar improvement in Rio Arriba County. The county would build an “analog simulcast system” and may need to improve the existing four towers or build a new one. In addition there needs to be OSHA compliant personnel quarters in the county’s fire stations, Ansley said. One attendee who said he has experience working on roads asked if road base would be laid before chip sealing roads. He said chip seal without the correct base develops potholes quickly. Ansley said that the $1 million bond for public roads would provide funds for road materials and four semi trucks. Additional meetings with county officials regarding the vote will be held before Aug. 16. A meeting had been held earlier Monday in Willard and another was held Tuesday in Torreón. Another meeting is set for 6 p.m. July 27 at the commission chambers in Estancia, with the last to be held July 28 at 6 p.m. at the Moriarty Civic Center. For additional information contact the County Clerk’s office at 505-544-4350. Anyone who is a registered voter residing in Torrance County can vote in the Aug. 16 special election. Jaramillo told attendees that early and absentee voting is already ongoing. The early voting sites will be open Monday through Thursday from 7:30 a.m. to 5:30 p.m. from July 19 through Aug. 11 and on Friday, Aug. 12 and Saturday Aug. 13.